The Fed surprised markets with a more hawkish posture than expected, suggesting the start of QE tapering in late 2013 and completion by mid-2014. While Fed guidance may not ultimately come to pass, EM equity markets in particular remain subject to further downside. True, this year’s sell-off has been much more rapid than when QE ended previously. But its scale so far is similar-to-smaller. The market sell-off may thus slow a bit or retrace temporarily, but EM equities are particularly vulnerable to a withdrawal of capital inflows. The market’s reaction to the FOMC’s latest press conference in which Chairman Bernanke apparently confirmed the imminence (i.e. within 2013) of QE tapering was swift and sharp: the S&P500 dropped 1.4% in the wake of the statement, the DXY rose 1.2% on the day (and on to 1.8% overnight) whereas risky assets such the MSCI EM lost 3.5% and “safe haven” gold dropped 5%. US 10yr Treasury yields rose by another 20 bps, on top of the 55bps increase since early May, and now hold about a full percentage point above their pre-May 22 level. Not only did Chairman Bernanke not backpedal on his then statement that QE tapering could begin “in the next few months” but instead he went further by suggesting that tapering could begin “later this year” and continue “in measured steps through the first half of next year, ending around mid-year”. This was driven by the Fed’s view that activity was expanding at a moderate pace, labor market conditions were improving and – crucially – that downside risks to activity had declined since last fall. The Fed is certainly on firmer ground now than when it ended its QE programs previously: at the end of QE1 in March 2010, the unemployment rate stood at 9.9% while non-farm payrolls declined at a 51K clip per month (on a 6-month moving average basis). The NFP flow had improved markedly at the end of QE2 in June 2011 to +183K (6mma) but the stock of unemployed was still high at 9.1%. 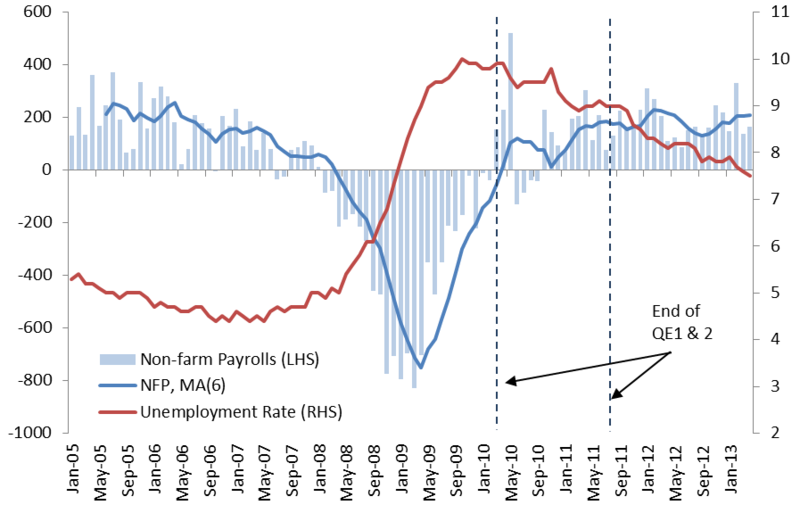 Currently (May), NFP are growing at a 194K average clip and the unemployment rate is down to 7.5% (see chart 1). However, it is clear that this is not the whole story. As recently as in the September 2012 statement, when the unemployment rate stood 7.8% (8.1% in August), Chairman Bernanke characterized the employment situation as a “grave concern”. The improvement in the unemployment rate since has been minimal (and a fortiori in other labor market indicators) and would not by itself suffice to alleviate “grave concerns”. And with inflation running persistently below the 2% objective and inflation expectations stable (and thus not supporting the case for policy tightening), it appears that the Fed may be becoming more sensitive to the costs – rather than the benefits – of continued, open-ended asset purchases. Indeed, it stated that the size, pace and composition of its purchases would depend on “the likely efficacy and costs of such purchases”. In other words, the further asset markets rally in defiance of only moderately improving fundamentals, the likelier a tapering of QE could be. Tapering, not Tightening: This is all about the second derivative – the Fed is set to continue to ease monetary policy throughout 2013 and at least the first half of 2014, only at a diminishing rate. Thereafter, monetary policy will remain accommodative as the balance sheet of the Fed will only shrink slowly, as bonds mature. Markets have reacted as if tightening was nigh. Tapering is State-Contingent: The Fed provided guidance, not a timetable. The announced schedule is contingent on unemployment continuing to fall, other labor market indicators improving, inflation remaining in line with target and overall activity tracking the Fed forecast (growth of 3.0-3.5% in 2014, unemployment at 6.5-6.8%). If this scenario does not materialize, the Fed retains its prerogative to adjust policy either way. What is more, the unemployment threshold itself could be revised lower from the 7% mentioned by the Chairman. Stocks vs Flows: Finally, it is worth recalling the stock vs flow debate. The Fed holds the view that it is the overall stock of asset purchases that matters. 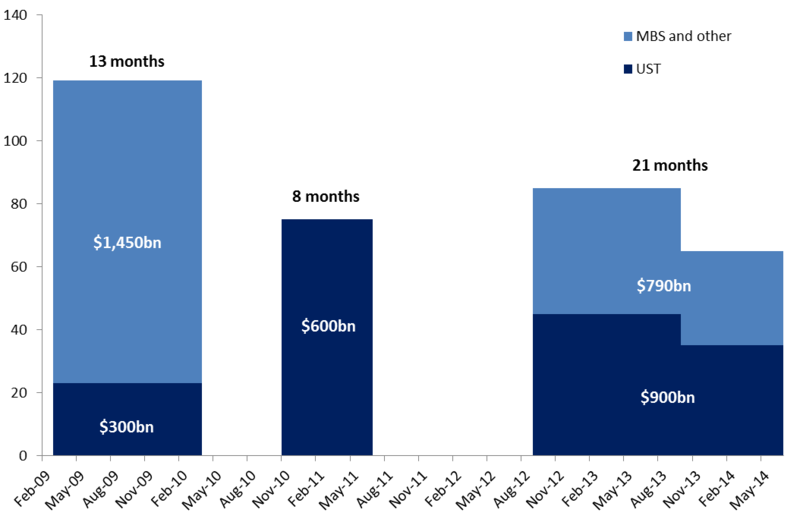 In other words, purchasing $100 bn for six months is equivalent to purchasing $50 bn for 12 months. The flow approach espoused by many market participants argues that it is the monthly “throughput” that is most relevant. In terms of economic impact, I side with the Fed’s view. Even if the Fed reduces its purchases to a $65 bn clip in in October, its total purchases will make QE3 the largest and longest of the three programs in terms of USTs (see chart 2). But the market has a point with respect to asset prices. It is not surprising that in light of an anticipated end of “super easy” money and a shift to simply “very easy” money, fixed income markets would be first to react. Indeed, 10yr US Treasury yields are up 27% since May 22 and 59% from their low in early May (some 100bps). They had continued to decline when QE1 and 2 ended. Risky assets are the immediate collateral damage: the JP Morgan EMBI Global total return index is down 10% since early May. But somewhat surprisingly given the prospect of improving activity, it is the EM equity market that has witnessed the biggest sell-off. The MSCI EM fell 15% in the space of one month. While this is similar to the drop recorded when QE1 ended in March 2010, it took two months to achieve the decline back then. When QE2 ended in June 2011, the sell-off went farther, with the MSCI falling a total of 26%. But again, it took place over a longer period, namely over four months. So the scale of this year’s EM sell-off is similar or smaller than during previous episodes but the pace has been much more rapid. The (obvious) precedent of a steeper market drop when QE ended and liquidity-fueled capital inflows slowed previously. The drag on growth slowing capital flows represent for deficit countries. A self-imposed slowdown by China, a key trading partner and investor for many EMs. Fluttering progress of the reflation policies under Japan’s PM Abe. A flaring up of political tensions in two linchpin EM countries, Brazil and Turkey. Slower EM earnings growth compared to DMs. The nature of the recovery of US activity, which leads to an economy that is more likely to emerge as a competitor than as an export destination. This all suggests scope for further downside for EM equity markets. But two caveats are in order with respect to the timing of any further sell-off: 1) the Fed may not be able to stick to the guidance it has provided, either because economic data disappoint or operational targets are lowered, 2) the price decline in EM has been particularly quick and could thus reverse temporarily. This being said, the sell-off across EM has been indiscriminate so far. Scope for differentiation thus abounds: it is clear that deficit countries like India, Brazil, Turkey and South Africa are more vulnerable to a reversal of capital inflows as liquidity dries up than their surplus counterparts, mostly in Asia. This post was originally published at Macro at Hart and is reproduced here with permission.